I Took A Huge Leap Of Faith And Here’s Why! 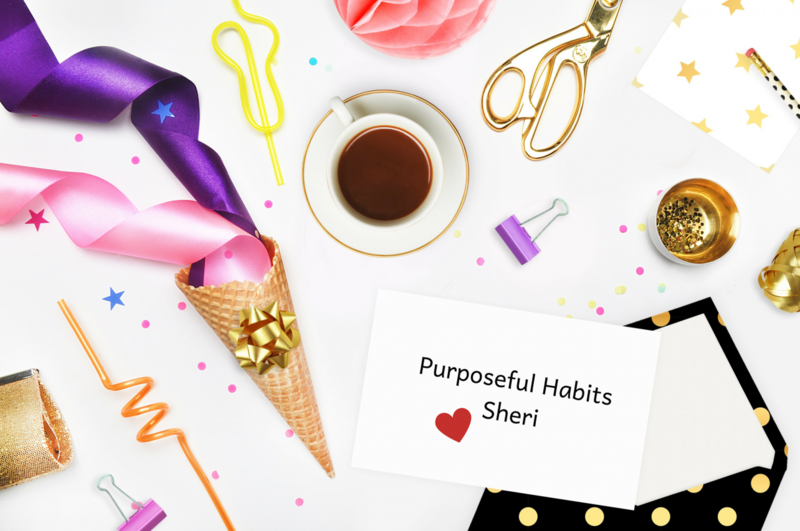 I’m happy to announce the official launch of Purposeful Habits. As you might have already noticed, my blog is no longer called A Busy Bee’s Life. It is now called Purposeful Habits. Yup! I rebranded my blog and want to share with you what’s been going on behind the scenes. This change might seem sudden as I was not open about my thoughts and decision to do this. For about 3 -4 months now, I have reflected a lot on where I am now in comparison to where I was when I began my blog. Did you know that I initially started my blog in order to help and connect with first-time moms? The more I was writing, the more I got back to my purpose. Which is to help people. So my blog morphed into a self-development and lifestyle blog, yet it was still missing that je ne sais quoi. For the longest time, I couldn’t figure out what it was. About a week ago, I actually had a dream where I was walking through a building with lots of doors, but every door I walked through seemed to bring me back to the same room. The room design was always the same, but the placement of the furniture and the colours were different. I woke up feeling like it was a symbol of moving forward, yet coming back to the same place; not seeing that element of change. Thought about it for a few hours that day then decided I was letting my imagination and/or subconscious get the better of me. A few days ago, I attended my wonderful friend Barbara’s Art Class. Right before the class began, she disturbed a piece of paper with a colour wheel on it. A blogging friend of mine had sent me the same colour wheel my very first week of blogging because I knew nothing about branding, colour schemes, marketing, nada. I smiled as the paper was set in front of me. Another sign? Again it was a moment of reflection of where I was as opposed to where I want to be. What Has Changed In The Last Few Years Since The Launch Of A Busy Bee’s Life? Many of you know that I am a personal development junkie. I encourage people to make changes to better themselves so they can live life doing what they love, yet here I was not willing to take that leap of faith. I woke up yesterday with the decision to just make the change. Go for it and see what happens. The change I wanted to make and the reason behind rebranding were to focus on how daily habits can transform your life for the better. I have extensive experience and wealth of information on this and want this to be the focus of my blog. So yes, I am still writing about self-love, self-help, productivity, and lifestyle changes, but with a better focus. Less about me, more about my readers. I started my blog to connect with first-time moms and to help me figure out what in the world I was doing. As a first time mom, I had so many questions and so did many others. I didn’t really know what I was getting into. All I wanted was to have at least five people read it, so we could ask each other questions, and feel happy in this adventure of life as mothers. The more I wrote, the more of a community I started to find. I slowly started to share more about my life and lifestyle, while giving advice on the things I thought would help. Writing solely for first-time moms no longer seemed to fit, as my advice was geared mostly to women yes, but not ONLY to moms. So, this name change? It’s about us. And it’s about supporting each other within a community of other passionate go-getters. The content on purposefulhabits.com will still be the same, but it will come from a more empowered place. One of the biggest signs for me was finding a hard time really explaining what I was doing and wanted to do because I had my sights on something more specific, but my posts were not reflecting that in the best way possible. If you ever have trouble defining yourself and explaining what you are passionate about, it might be time for a change. You need to have the courage to follow your dreams. Yesterday, I decided to ask only five people to give me a quick yes or no answer on what they thought about this change. I didn’t go into much detail. That would have only swayed their answers one way or another. All I asked was what they thought about the new name I had chosen ( it wasn’t actually this one, but similar) and my reason for changing. – A former work colleague – YES – It will transform your message better. – A blogger I really care about – YES – first suggestion not catchy enough, but this name is perfect. – Best friend – YES – this is more YOU! The real you. – A blogger I go to for questions – NO! You will lose ALL your followers. – The hubby – Hmmm…….ja warum nicht? (yes, why not?). I asked these specific five because I wanted honest answers. The one response from the blogger who said no was not about me staying true to myself, but rather, about the effects it would have on my social media presence. Nothing about my actual blog itself. Understandable, looking out for me, but yet, it’s not what my life’s about. Of course, I love having followers, and people who read my blog. It is humbling and does lots for your ego. However, Facebook and Instagram could disappear tomorrow. Then what? To be fair, none of them knew I had reached a point of self-doubt. Content creation is what blogging is. I need to write about topics I am 100% obsessed with. Habits. Good purposeful habits. Could talk about it for days. I am all about people and making connections. LOVE to help people who want it and need it. Everyone who reads my blog or follows me on social media should see a real human. Someone with both flaws and talents. A person to genuinely connect with. One thing I always say is that change is good. If I want to preach that, I need to practice it. Over the next few weeks, you might notice little tweaks and changes to my site now that I have rebranded my blog. The categories, the wording, the small stuff. I am not doing a huge overhaul of my website, so much of the look will remain as is. And if it doesn’t, then it means I am growing and evolving right? One thing that will stand out is that I am using more pictures of myself on social media. Who knows, I might even start doing short little videos. No more hiding behind the camera. Out of the comfort zone, and into the world. Well, the virtual one at least. Values are what matters most to you in life. They help bring clarity and lead you on a path to fulfilment. It is possible to reinvent, rebrand and redirect your life, and it’s never too late to start. I hope my story will encourage you to identify and pursue your passion. The choice to rebrand brought me back to the true, 100% me. Are you planning on reinventing or rebranding yourself? What do you think about the fact that I rebranded my blog? Share with me in the comments section below. Remember to follow your heart, it knows the way. To be honest I have thought about doing the same for 4 years. I lack the courage to embrace the change you speak of. Kudos to you. Great job. You know how wonderful I think you are. Excellent job on the rebrand. I am happy you took this step forward. You deserve the best.